The level of hyperbole about Alan Chadwick and his methods, promoted by the press, at times reached outrageous proportions. While probably well-meant, still the object was clearly to sell newspapers, magazines, and books. Alan always appreciated public attention directed toward his ecological message, and so he suffered these obvious exaggerations with resigned amusement, although at times he would quip that John Jeavons had become a little too carried away with his calculations. But Chadwick, of all people, understood the need to be theatrical: That was his regular modus operandi. The following article, "The Magic Gardeners," is a case in point. Here the hype really goes "beyond the beyond," to use one of Alan's favorite expressions. There is nothing magical or paranormal about the effect of beauty on the human soul. It is, in itself, transcendent. 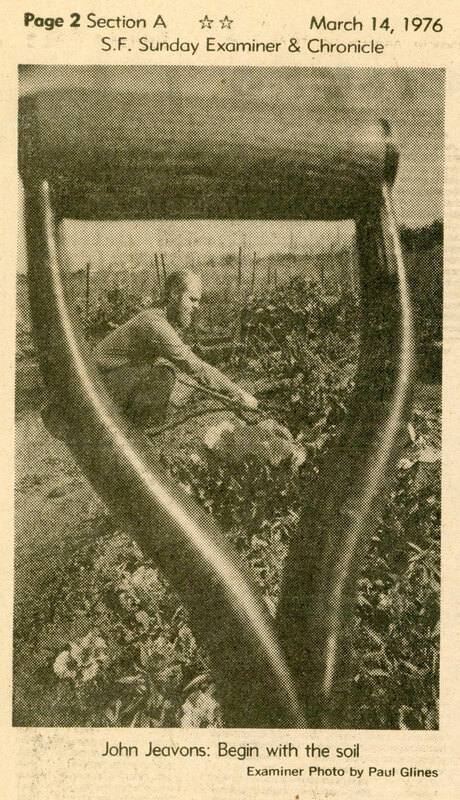 Alan Chadwick grew enough vegetables to feed his workers, but most of his garden space was devoted to cut-flowers and ornamental plantings. The effect was always breathtaking. Alan often said "When you follow the technique to perfection, then the technique disappears." Classical horticultural technique is a powerful tool to create an abundance of food and flowers, enchanting places and charming environments. But when executed with the utmost technical perfection, that technique disappears and the effect appears to be purely natural, as if the garden just grew by itself. For that reason, Chadwick's gardens always seemed magical. This is exactly the feeling that the technique is designed to evoke. Hardly. If we understand the word "mystic" to designate someone who has reached a level of spiritual mastery so as to be able to see the subtle dynamics in life that operate behind ordinary physical sense-based observation, then maybe Alan Chadwick would qualify. But the other thirty-four of us were just thoughtful young adults trying to learn the techniques of classical horticulture from a master of the art. Aside from that, Round Valley is clearly marked on the map and is, although remote, in no way hidden. From time to time, skeptics of Chadwick's methods would visit the gardens. These were usually apologists for modern commercial agriculture with its reliance on heavy machinery, chemical fertilizers, and virulent poisons. I recall hearing one fellow accusing Alan in more or less the following words: "Mr. Chadwick, this is all very well, but how do you intend to feed the world this way?" Alan cocked his head, peered deeply and compassionately into the man's eyes, and replied, "I merely do what I can. Feeding the world is not my responsibility. The world, my dear sir, is in the hands of God." -- ...may soon be possible to grow a complete, balanced diet in 15 minutes a day on as little as 1250 square feet. This is an example of Jeavons' characteristic poetic license. 1250 square feet is about 35 feet by 35 feet, enough land to grow sufficient vegetables for one who is eating the standard North American diet, but insufficient to grow the other components of a "complete, balanced diet" such as oils, grains, fruits, nuts, dairy, or meat. Jeavons has consistently overstated the results of his version of Alan Chadwick's horticultural system. Chadwick's methods were revolutionary, not miraculous. 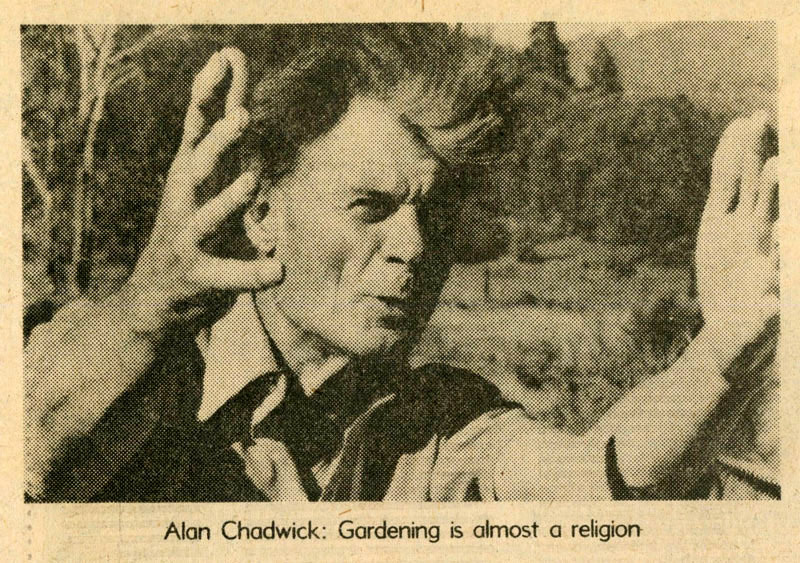 -- Gardening is almost a religion. If one thinks of religion as blind faith in a revealed doctrine like the major creeds of the modern world: Christianity, Islam, Hinduism, etc., then gardening does not belong in that category. Alan would never have presumed any such thing, and to suggest so is completely preposterous. But if you go back to the etymological roots of the word "religion" (re "again"; ligio "connect" as in ligaments) then you can understand Chadwick's insistence that his garden project was a "religio-philosophical" endeavor. He saw the immersion into the natural world, through the medium of the garden, as a way to "re-connect" his students to a more meaningful reality than that seen in the mainstream of commercial, materialistic life, as for example, in the modern-day obsession with the automobile. But, despite these outrageous exaggerations, one must duly recognize that this article appeared on the front page of the San Francisco Examiner, which at that time included the Sunday edition for the San Francisco Chronicle, with a combined print run of 500,000. 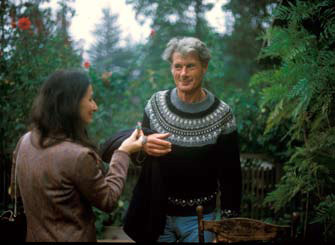 Alan Chadwick was widely renowned and respected as the person who introduced an ecological form of agriculture to the world. That he did this despite all of the propaganda from the universities and agrochemical companies, who colluded in trying to silence him, is a testimony both to his dedication to the cause and to the power of truth to find a foothold in the face of overwhelming persecution. 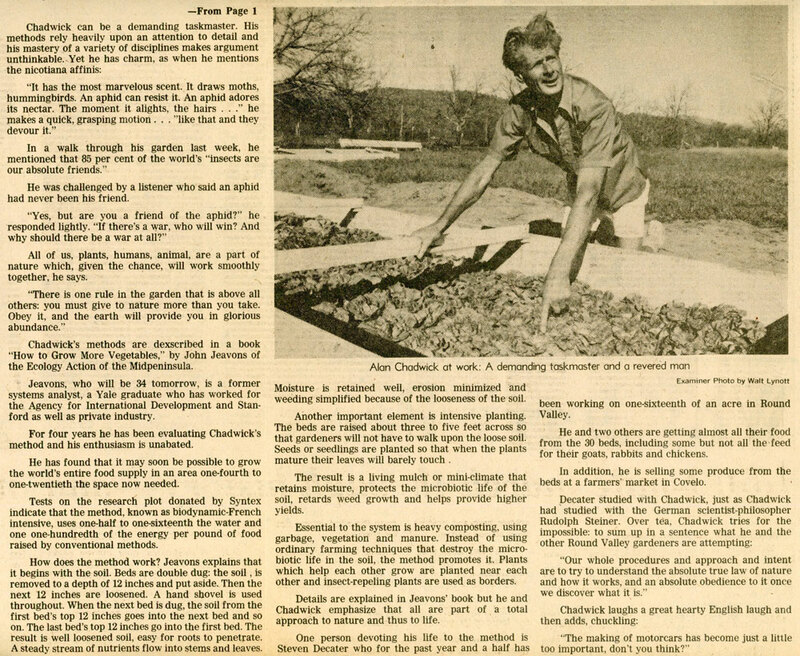 Articles similar to this one appeared all over the country as word of his unique approach to gardening began to spread. Most of the time, each article resulted in one or two new apprentices showing up at the Project, wanting to join the work.